Lieutenant Hiscox is in charge of the Records and Civil Divisions at the Sheriffs Office. The Records Division is responsible for all records on cases both open and closed The records clerks retrieve reports and provide them to courts, citizens, and insurance companies on regular bases. The Civil Division handles Sheriff Sales, process warrants, and protection orders from the courts. Lieutenant Hiscox other duties include Public Information Officer. As Public Information Officer, Lieutenant Hiscox is responsible for media requests, answering their questions regarding both active and closed cases. Lieutenant Hiscox conducts safety and security inspections and several times throughout the year he conducts the Senior Police Academy. 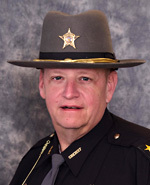 Lieutenant Hiscox has been with the Sheriffs Office since 1993. He concluded 23 years as an insurance agent before coming to the Sheriffs Office. He and his wife Marsha have been married since 1975. They have two daughters Lisa and Ashley and have lived in Geauga County for most of his adult life. They live in Burton. Lieutenant Hiscox is a member of the Ohio Crime Prevention Association, the BSSA, and was a member of 2006 Leadership Geauga Class.